Just coming back from THE food blog exhibit taking place in France. I got a tone of ideas ! I had the chance over there to make a stunning lemon meringue pie together with Anelyse Chardon and some friends (managing a cooking blog as well of course !) : Valérie, Maeva and Gaëlle ! You can check their blog reading the French version of this post. I wanted so badly to bake this pie again and Adrien to taste it. So delicious ! Here I am in my kitchen with beautiful clementines coming my FruitsFrais box ! 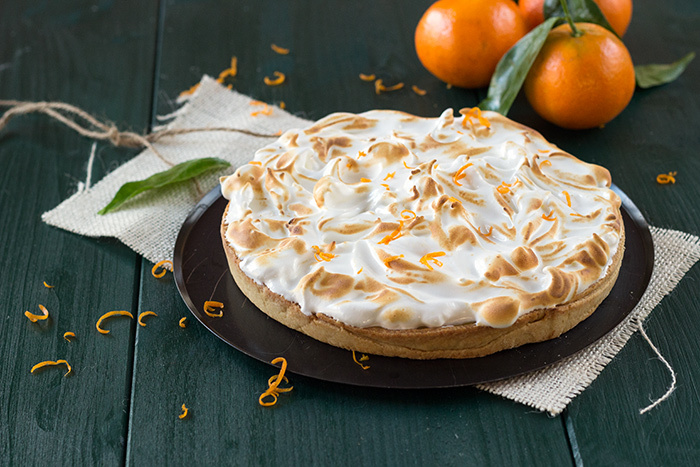 And then I heard myself saying, alright a meringe pie, yes but with clementine that’s even better. 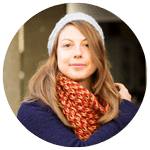 If you live in Switzerland, do not forget, you can participate to a challenge on the French speaking part of this blog, in order to receive like me a great box full of fresh fruits and vegetables. Add flour and sugar in a mixing bowl. Make a hole and add, egg, olive oil and water. Mix using your hands until you get a homogeneous dough. Roll out dough finely, put in your pie plate and refrigerate 30 minutes. Bring to a boil lemon and clementine juice with ½ of sugar (60 gr.). In the meantime, beat egg yolk with whole egg, flour and rest of sugar. When juice is boiling, pour half on top of the egg mixture, whisk quickly and pour on top of what's left of the juice. Cook another few minutes, until you see the first bubbles. The cream is ready. Remove from the heat and add while mixing olive oil. Reserve and leave to cool. Preheat oven to 200°C. Remove the crust from the refrigerator, prick with a fork, cover with baking paper and add some cooking beads. Bake for 8 minutes. Remove carefully from your pie plate and bake another 4 minutes for a golden crust ! Pour clementine curd and reserve. Bring to a boil water and sugar. As soon as boiling, time 3 minutes and remove from heat or when the sirup reach 110°C. In the meantime, beat egg whites and pour sirup little by little until you get a homogeneous and shiny mixture. Then this is ready. 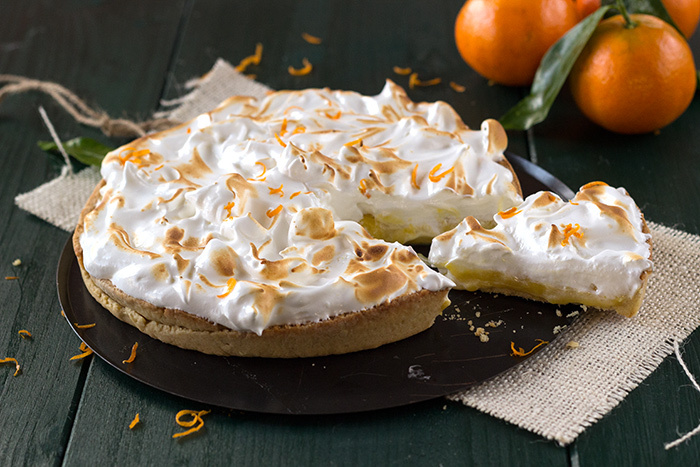 Cover the pie with meringue using a spatula or a spoon handle. Strocke the flame of the blowtorch over the meringue until it browns and serve. 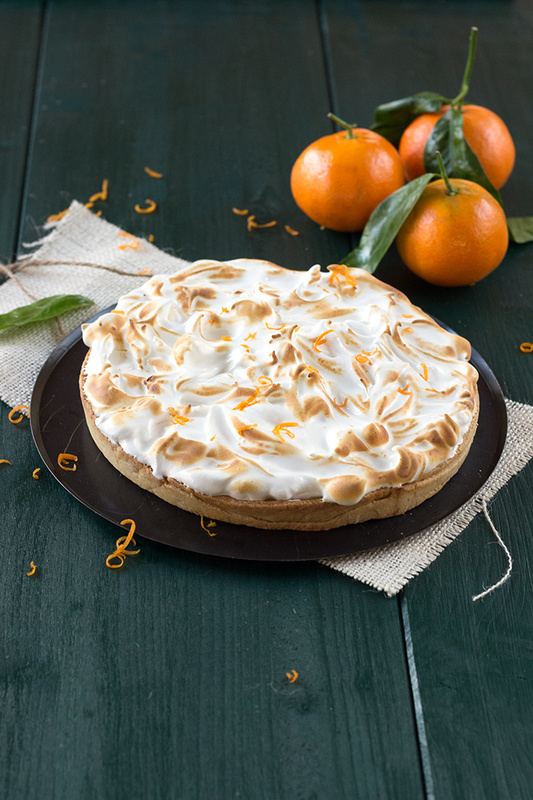 Today is National Pie Day so it is a great day to explore a new pie like this beauty!